My theme for Projekt Revolution could’ve easily been “bands I listened to a whole lot in high school but never got around to seeing.” With the exception of My Chemical Romance, all the bands on the bill pretty much fit that description. I first heard of HIM the way many other American’s my age did: through Bam Margera. Admit it, you thought Bam came up with the Heartagram symbol and then you felt really stupid when you found out it was actually HIM’s symbol. Don’t lie, I did too. That mix up though led me straight to the music of HIM though, so I was most definitely excited to see the boys live even if getting through security made me miss the first 15 or so minutes of their set. The band seemed super laid back in their performance, with lead singer Ville Valo smoking a cigarette onstage. Watching them, you really felt like you were watching a bunch of rock stars who didn’t have to put on a crazy show to get their point across. Something tells me that HIM stood out like a sore thumb on this tour though, but I can’t completely say that since I missed Placebo. Musically, they are very different from Taking Back Sunday, My Chemical Romance and Linkin Park. Plus, Ville made a comment before performing their single “Kiss of Dawn” which is on their new album Venus Doom (due for release September 18) saying something along the lines of “Everyone on this tour is so happy… we’re the only sad band, so here’s another sad song before all the happy bands come on to play…” And it totally rang true, as every set after that was pretty… well, happy? 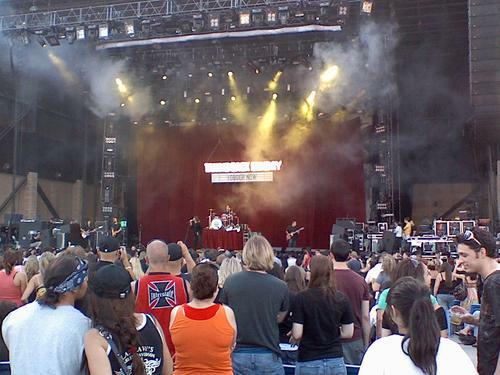 Next up: Taking Back Sunday who put on an AMAZING show….. oh wait! I’m sorry, I was thinking of 2002. Taking Back Sunday is one of the only bands I get totally music snob on, so my apologies in advance for my opinions on this band. Their debut album “Tell All Your Friends” is one of my favorite albums of all time, but after they lost guitarist and backing vocalist John Nolan and bassist Shaun Cooper, everything went downhill… the quality of their records, their live shows, their song writing, etc. Their performance Saturday put that in perspective for me. I already knew I couldn’t stand all but two songs from their records released since their debut but the live show was something I needed to see for myself. About 30 seconds into their first song the only thing that went through my head was “I need to get out of here” but I toughed it out, hoping that maybe it would get better. It didn’t. I did get a good chuckle though watching lead singer Adam Lazarra swing his microphone all over the place, it reminded me of an old shirt from the band Brand New that was actually aimed at Lazarra that read “Mics are for singing, not for swinging. You know who you are.” Taking Back Sunday’s retaliation of the shirt was “If you’re not swinging, don’t sing” which was cute, but perhaps Lazarra should’ve taken the hint from Brand New. Sorry Adam, no amount of swinging your microphone around or doing any other crazy stage antics is going to take away the attention from your vocals, which sound so torn up now. To me at least, it sounds like he hasn’t been taking care of his vocals which is something most vocalists take quite seriously. Perhaps the most painful part of the set though was when the band performed two songs off of their debut album. Hearing the opening to “You’re So Last Summer,” I’m pretty sure I began to think out loud with the “Oh no, please, no!” probably making the people next to me think I was deranged. However, hearing that as well as “Cute without the E (cut from the team)” was enough to almost bring me to tears, and not in the good way. It was sort of like realizing the band you absolutely adored in high school had officially gone to waste. I know every Taking Back Sunday fan is going to hate me, but oh well. My only advice: listen to Straylight Run. 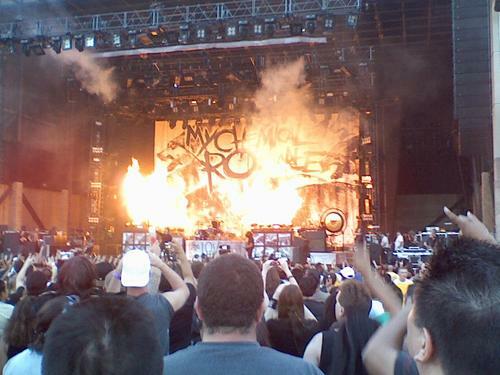 Next up was the band I was most excited to see: My Chemical Romance! They’re currently the only band I’ve ever flown out of state to see. I was super curious as to how they would go about their set as on their last tour they came out as “The Black Parade” and performed the whole new album from beginning to end and then they came out as “My Chemical Romance” performing songs from their older albums. I was also curious as to the whereabouts of bassist Mikey Way. Well, they didn’t come out as the Black Parade, instead they played a mix of old and new songs. And Mikey Way… well he wasn’t there, and it was kind of sad. This ‘extended honeymoon’ is kind of long, don’t you think? Anyways, the band put on an amazing set as usual. 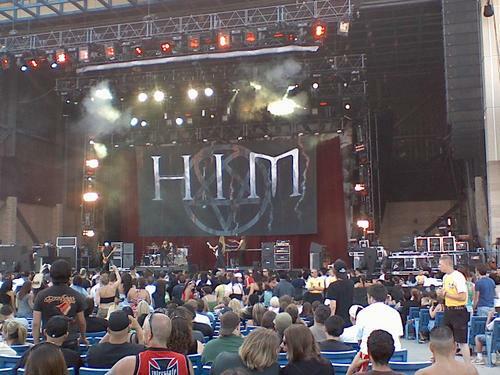 I was sitting in my seat just wishing I was in the pit, and I hate pits so that actually says a lot. It was also awesome seeing James Dewees of Get Up Kids and Reggie and the Full Effect fame on the keyboards, as I thought he was only on for the Back Parade tour. The band played mostly newer songs, “Welcome to the Black Parade,” “Famous Last Words,” “Mama,” “Dead” (which made me quite surprised that they didn’t play “The End” since the two go hand in hand) and my personal favorite, “Teenagers.” Lead singer Gerard Way looked… well, he looked damn hot. Like better than usual, hot. This is my review, I can fangirl just a little! Drummer Bob Bryar (who my friends and I refer to as “The Man, the Mystery: Bob Bryar” due to the lack of information there is on him out there) was atop a spinning stage with multiple drum sets on them and he’d go back and forth playing them depending on which ones he needed. From their old album they played “I’m Not Okay,” “Helena” and then “Do you know what they do to guys like us in prison?” Gerard grabbed guitarist Frank Iero and kissed him. No, he didn’t kiss him, he flat out made out with him. Prompting the majority of the crowd to go quiet with our jaws dropped for the last part of the song. It then prompted a flood of “DID YOU JUST SEE THAT?” text messages between friends spread out across the venue. I actually watched a video of it yesterday and cracked up at how the girl filming the song just starts insanely screaming and then the camera goes out of focus because she’s freaking so badly. That kiss is still being talked about on celebrity gossip blogs! And I was there. It’s one of those things you always hear about happening at shows but never get to see. Anyways, getting back to the show. The band closed with the song “Cancer” which is a good song, but not a closer! It’s depressing and a downer, they should’ve closed with “Teenagers” or even “I’m Not Okay” instead of going out on a sad note. Other than that though, I thought their set was great. 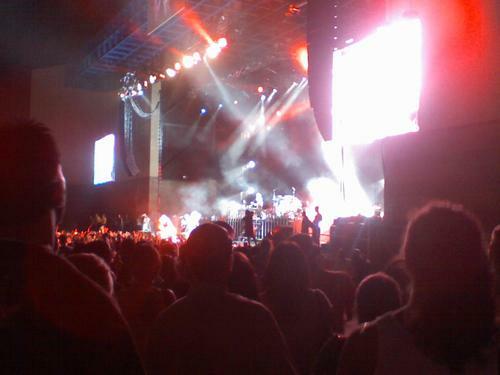 After that it was time for the headliners Linkin Park! I still remember when I was in middle school seeing advertisements on TV to buy their debut album “Hybrid Theory.” I eventually did get it and it quickly became one of my favorite albums but as I got older, I pretty much forgot about it. I didn’t listen to Linkin Park’s new stuff besides the singles that were on the radio and even though I didn’t think it was bad, I just never got into it. Still, I was excited to see them play, it was almost putting closure on that fandom in my life. The band opened with two new songs from their new album “Minutes to Midnight,” and though I didn’t know the songs it was too hard to not get into it. Honestly, I think my favorite thing about Linkin Park is emcee/vocalist/guitarist/keyboardist (what does this guy not do?) Mike Shinoda, who I had the pleasure of running into at a show back in 2002 when I was 15. I remembered thinking he was the nicest guy ever when I met him because before show he walked by us standing outside but didn’t stop for fans because he was in a rush to get to an appointment and when I saw him later on that night he apologized profusely telling me how he ‘hates’ when he has to do that to fans and that he was so happy some of the people he had to deny meeting earlier were able to find him. He was so genuine, kind and appreciative and that was about two years into Linkin Park’s success. Five years later, it was so easy to see without meeting him again that the genuineness I saw in him in 2002 is still strong in 2007. It was so fun watching the guy, he seemed just so happy to be on stage performing! When a performer is having fun on stage it relays back to the audience who in turn will have a blast which is exactly what the crowd was having. Driving home, I made my friend play “Hybrid Theory.” It’s been years since I listened to that album, and now, like when I was 15, I can’t get enough of it. I’m listening to it right now! It was great getting to see Linkin Park live for the first time, and I really do hope it won’t be the last. Ohh, you're so lucky you saw Linkin Park! I love them, they're so much fun and I agree they're really damn talented. And Taking Back Sunday is just a mess live. I heard them a while back and was like WTF? Serious studio editing there hahah. The Taking Back Sunday raragraph was dead on. That pararagraph word for word is exactly how I feel about them. Straylight has the real talent. Not sure why the word paragraph is ripped apart in my last comments. I really can spell. i really enjoyed your review! whats funny is, i was able to relate to just about everything you said...including listening to tbs and linkin park back in the day and all of that just kind of dying away. i think you wrote beautifully and it kept my attention which most reviews don't do for me. i do wish you would have seen placebo though, they are the main reason i'm going to the concert on sunday...and despite how my boyfriend feels, i am excited to see linkin park...i saw them back in 2003 so it will be very interesting to see how theyve changed and evolved. That setback sounds no fun, but you still managed to get great shots! I laughed pretty hard when I read the part where you thought Bam came up with the HIM symbol and later got the reality of it. Can't wait for the new post! You did a great job reviewing this show. I'm not the biggest fan of any of the bands that played (mostly because I haven't given them a chance), but I have to admit that your write-up got me curious and I'll be giving them a listen. Once again, I am jealous, but with your review I feel like I am there. I love reading all your reviews! wow, great review! i love that you put humor and your own opinions into it. i wish I could have been there, sounds like a great time! what a friggin awesome review! dang it frances i love reading what you have to say cuz you're so bloody honest! hahaha now i know not to see taking back sunday! hahaha. 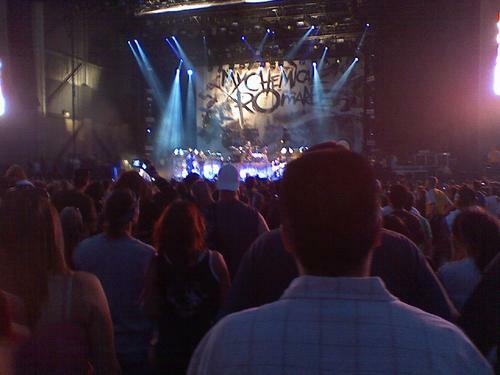 thats so awesome that you got to see mcr and linkin park. i have no idea who him is but ok. once again YOU ARE THE BEST! awesome review! you made me feel like i went to the show...i wish i did, but at least this is the next best thing! AMAZING review! It looked like so much fun!! man, now i know i really wanted to go to this... awesome review! Brilliant. I felt like I was there. Great!!!!! Wonderful review! I kind of wish I'd been to a Projekt Revolution show, but.. well, here MCR, LP, and HIM each came separately, so I decided just to go to MCR and LP. *pouts* But Gerard and Frank didn't make out. In fact, I'm a huge asset to this organization, which is why I'll be checking off "exceeds expectations" across the board, thank you very much. I may sound pompous, but I'm not a complete idiot.